Google Chrome users with Apple's next-generation 15-inch MacBook Pro can now take advantage of the high-resolution Retina display with their browser. Google announced on its Chrome blog on Tuesday that the latest "Stable" release of its browser adds support for high-resolution Mac Retina displays. The software is now available for download from Google's website. The search giant first announced in June that it was working on adding high-resolution support to its browser for Retina display Macs. 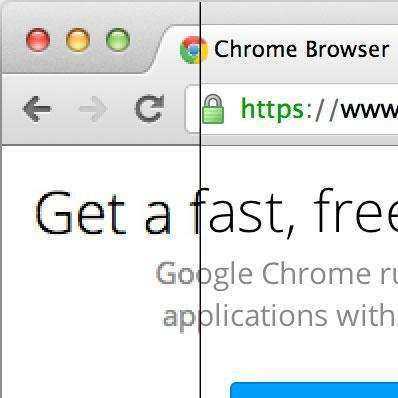 Chrome stood out as one popular software choice that looked particularly poor on the Retina display MacBook Pro. Released at the Worldwide Developers Conference in June, the 15-inch MacBook Pro with Retina display has a screen resolution of 2,880 by 1,800 pixels. Optimized versions of Apple's own software for OS X, including its Safari Web browser, became quickly available, while some third-party applications took more time. Chrome and Valve's Steam were singled out by AppleInsider in its own review of the MacBook Pro with Retina display. While Chrome has now been updated for the Retina display, Steam and other popular applications, like Adobe Photoshop, have yet to be updated.